Dramatic Footage - Hypersonic Weapon Above Russia? Did Dramatic Footage Capture Hypersonic Weapon Above Russia? A very mysterious bluish-green fireball seen streaking above Russia's high-tech scientific city has sparked a debate that President Vladimir Putin could be developing space weapons. The flash was spotted by stunned motorists with dashboard cameras mounted on their windshields near the research town of Akademgorodok, an educational and scientific hub in Siberia. According to the Daily Mail, educational and scientific institutes in the area have been called Putin's "secret weapon," which have aided in the development of the country's high-tech weapons. The video was caught on several dashcams in the early morning on Tuesday. 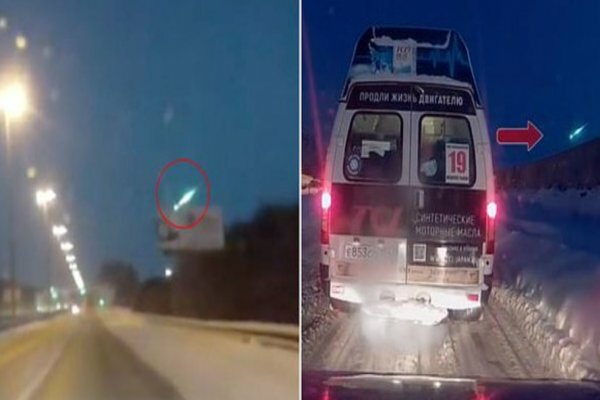 The state-run Russia Today reported it as a meteor but acknowledged that scientists were confused by the incident. The video sparked rumors on social media that Moscow was testing "extremely advanced weapons," while others put on their tinfoil hats and suggested it was a UFO. Ilya Orlov, deputy director of the Big Novosibirsk Planetarium, told the Daily Mail it was a "beautiful phenomenon" but could not explain what caused it. "Most likely, this is a flash of bolide, that is, the fall of a bright meteor with a flash," Orlov said. "It is all the more surprising because there are no active meteor showers now. It can be either the tail of a [Leonid] meteor shower or a lone meteor. We need to find out," he added. Local media outlets said no traces of space rock was found in the region, nor were there any reports of rocket launches or missile tests when the fireball was spotted Tuesday, which has undoubtedly excited the tinfoil hat community - believing that it could have been a UFO. This is not the first time fears of Russia's secretive weapons have been raised. Putin used his state-of-the-nation speech in March to deliver a stern warning to the US that Russia possesses hypersonic weapons that can render NATO’s US-led missile defense system completely "useless." Russia has "successfully" test-fired hypersonic missiles, one, in particular, the high-precision Kinzhal (Dagger) hypersonic missile was fired from a MiG-31 supersonic interceptor jet in late March that took off from an airfield in the South Military District in Russia's southwest. There was evidence from China last month that a similar fireball was indeed a Chinese People's Liberation Army hypersonic missile, confirmed by Chinese state-run media outlets.